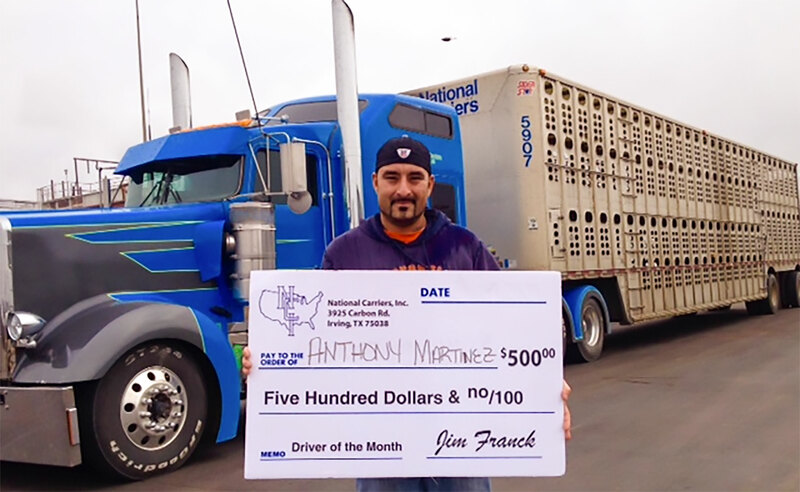 National Carriers is pleased to announce owner operator Anthony Martinez has been named Driver of the Month for October 2014. National Carriers uses a strict criteria when choosing a driver of the month. Martinez met or exceeded all requirements which determines National Carriers Driver of the Month. He is now a finalist for the Driver of the Year award for 2014. Martinez said “I was not expecting this award. I come to work every day and when I am here that’s what I do work. I just do what I am told to do.” Martinez lives in Liberal KS with his wife and children and has worked at National Carriers since March of 2013. To stay updated on National Carriers via our social media community: www.facebook.com/nationalcarriersinc Pinterest.com/nationalcarrier YouTube.com/nationalcarriers Instagram.com/nationalcarriers or follow us on Twitter.com @NationalCl. Industry news National Carriers business updates and recruiting information is featured at www.nationalcarriers.com or www.drivenci.com.